A team member can help manage multiple groups, but must be invited in order to access a group’s media library, social profiles and calendar. This well help restrict access to sensitive media and social profiles. Media items are attached to a group and not to a social profile. When moving social profiles between groups, only the posts will move, not the media. Groups is a feature available only for paid plans. If you’re already on a paid plan all you need to do is go to Later on the web to start creating your first group! If you’re on a free plan check out a plan that’s right for you! Now that you have access, let’s create our first group! At the bottom left corner of the menu click the Group Selector. This is your default group or Main Group. Click Manage My Groups to go to the Social Profiles & Groups Admin page. Next, click Create New Group at the top of the page and add a name to your group. Finally, add a profile picture to your group to easily distinguish & toggle between groups. Simply click EDIT beside the group’s name and click on the Group avatar to add a photo and Save. Invite team members to collaborate in a group! Remember, your team members will only have access to the photos, videos and social profiles connected to the group(s) you invite them to. Note: Initially, your default group will be accessible to all of your team members. If you have sensitive media in your default group make sure to remove team members from the Social Profiles & Groups Admin page. Finally, select Add beside the name of the team member you’d like to invite to this group. 1. Click Team Members on the left side menu. 2. Click Add New Team Member and enter your team member’s name and email. 3. Click Invite User This will send your team member an email invite to Later. 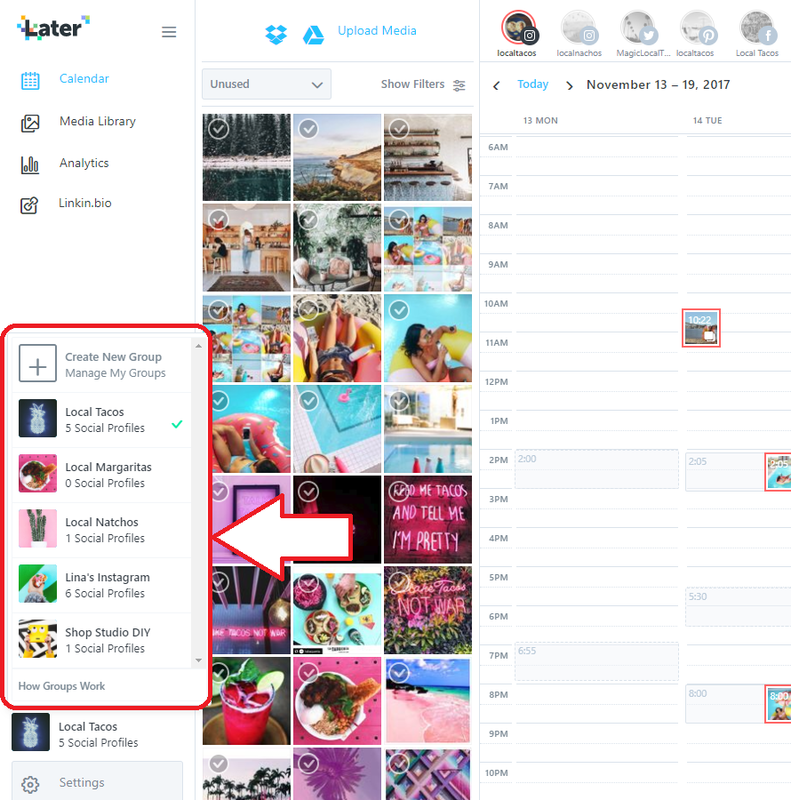 Now that you know how to create a group, add a collection of social profiles, and invite team members to join, you can start creating multiple groups to efficiently manage your social profiles and strategically collaborate with multiple teams. And don’t worry, we’ve got you! Our new dashboard is designed to make it simpler and more intuitive to manage groups of social profiles. Just toggle between groups, add media, and schedule. To toggle between Groups, select the Group Selected found in the bottom left of the sidebar. This is how you’ll switch between groups and start scheduling your posts. Once you’re in the group you can begin bulk uploading all your photos and videos to build an exclusive Media Library, schedule your week of posts, or manage the group’s social profile(s) and user permissions. Go to the Group that contains the media you wish to transfer.